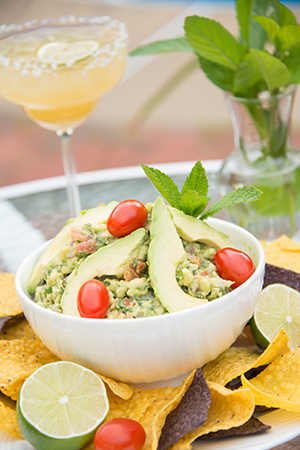 For a refreshing change in hot weather, serve this guacamole with blue and yellow corn tortilla chips. This recipe was featured on the 2013 Herb Tour, so mint is the extra special touch. Mix the avocados, tomato, onion, cilantro, mint, jalapeno and lime juice. Season with salt and pepper to taste. Sprinkle guacamole with the cheese, or if you prefer, use the microwave to melt the cheese and spoon over the guacamole. Garnish with cherry or grape tomatoes and serve with tortilla chips.